Yes, I decided to take the scenic route. (Also known as the cheapest way to travel). And I’m very glad I did.I took the 9am flight on Maya Island Air from San Pedro to Belize City Municipal Airport. Only $40bzd for the most of October and with the water taxi $30bzd? It wasn’t even a choice. I hadn’t been to the Maya Terminal since they remodeled it about a year ago. Instead of the old wooden “house” with the outside waiting area, the terminal has been revamped. Turbo-air conditioning, plush chairs, a large screen TV and nice bathrooms, you wouldn’t even recognized it. And most flights are 50% OFF IN OCTOBER! These things are actually pretty comfortable. The flight took off on time and we stopped first at the International Airport and then at Municipal. Flying is REALLY the way to go for the best possible view. Make a point to do it at least one way. Here is Caye Caulker out the window. All in all, it took about 25 minutes. I jumped into a taxi to head to the bus station. This may look close to you on a map but don’t try walking. Belize City streets twist and turn and you’ll head into some shadier areas that you wish you hadn’t. Spend the $6-8bzd. The bus station is an interesting experience. It’s a wide array of people going all over the place. There is no posted schedule, there are no open ticket windows, there is no information booth, there are about 8 different bus companies. Find one of the guys in the yellow shirts. These guys are everywhere and the shirts say “Transport Management” or something like that on the back. They will tell you what to do. When everyone jumps up for a bus at a certain “terminal”, just ask them which bus is coming. Don’t worry…you’ll find the right one. I did. And also don’t worry about buying a ticket, get on, get a seat, the ticket collector will find you once the bus is under way. It’s the only way to purchase your fare. Here’s the the concession stand cassa nova that kept telling me he wants me to be his baby. Thank you for the offer, my diminutive friend. I’ll need to think about it. Mostly think of all the discounted Ritz Bits, Pringles and Takis I would get…and I do like being called “hot stuff”…hmmmmm…. A quick note: go to the bathroom before you get to the station. Let’s just say that the 50 cent fee they charge for its use is most certainly NOT used for cleaning staff or cleaning products. The Punta Gorda bus leaves hourly and stops in Belmopan ($4bzd), Dangriga ($10bzd) and ultimately Punta Gorda ($22bzd). The trip to the nation’s capital was easy…barely more than an hour and we didn’t stop once. It was straight through. More than half the bus exited in Belmopan (lots of people that appeared to be attending college) and tons of people loaded on with all of their food shopping bags and boxes. Belmopan has a bustling vegetable and fruit market (and honestly? not much else). We turned south onto the Hummingbird Highway and I saw the reason why everyone should take this trip at least once. As you climb up into the mountains on a very narrow supposedly two lane road, the scenery is spectacular. 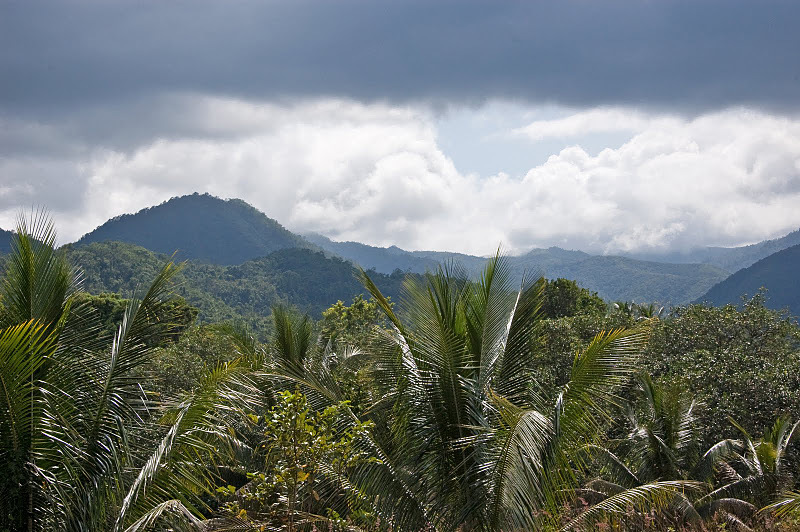 Sharp and steep, jungle covered mountains. Deep valleys rolling with orange groves. Narrow bridges over rocky creeks. Bridges barely wide enough for the bus to go over. It’s really the most impressive scenery I’ve seen in Belize. Similar to the cloud forests of Costa Rica (but not quite THAT good). There are quite a few tempting signs for national parks and waterfalls along the way…I’ll have to rent a car someday and do this again. The scenery definitely takes your mind off the fact that the bus stopped about 30 times. All the shoppers got off at various villages, our bus driver stopped for a soda, we stopped so the ticket guy could get a snack, a woman got on to sell the passengers fresh baked bread and buns (the smell was ridiculous). Villages and houses are pretty sparse, particularly as you climb upward, so everyone got dropped off at their front doors. 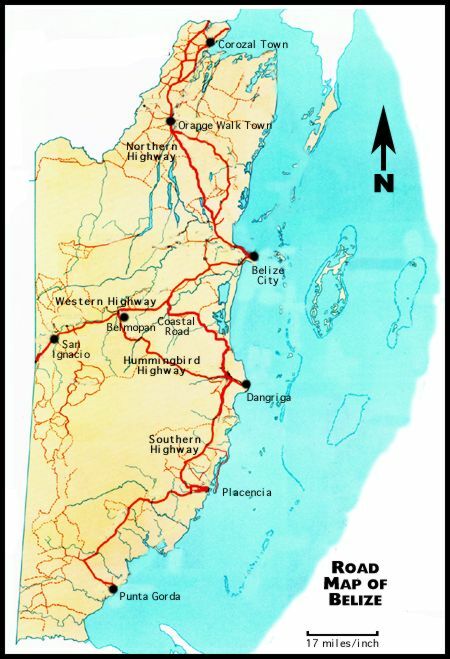 Though about same distance, the trip from Belmopan to Dangriga is about twice as long as Belize City to Belmopan. This old bus was really chugging up some of the hills. Oh well…I was digging the scenery. After driving past miles and miles of orange tree and a few very large juice producing plants, I was dropped off at the cement bunker called the Dangriga bus station. I remember at some point, Tripadvisor called Dangriga an “up and comer”. Perfect! I had four hours to walk around and get some food before the bus to Hopkins. Up and comer…interesting. Not the words I would use. Dangriga really makes you feel like you are in a small Caribbean island city (which you sort of are)…maybe Kingston, Jamaica or St. Georges, Grenada. It’s sleepy sprawling town with men lounging around in front of their houses sipping beer and listening to reggae. The distinct smell of ganja is almost everywhere. The people I met are incredibly friendly and proud of the place. It’s not like San Pedro where most people are from another part of the country or part of the world. Everyone was born and raised in ‘Griga. Locals wanted to hang out and get a beer or show me the places they thought I should see. And I got incredibly lucky for lunch. After leaving the bus stop, I wandered a few minutes up the main road and really didn’t see much of anything. I did take a quick look at the beach…it seemed okay but the water looked like it had a muddy bottom and it was pretty deserted. I went back to the main road and asked a young guy where I could get something to eat and most importantly, a bathroom. (You really have no chance to use one during the entire bus journey – in you are dumb enough like me to drink 2 bottles of Diet Coke, ask someone to watch your seat – that is critical – and jump out quickly at Belmopan.) Dorian told me to come in, use his grandmother’s bathroom and stay for lunch. “She just finish da hudut”. I pretended to protest but I love garifuna food…so I came in. Here is grandma. How gorgeous is she? She said she can’t remember if she is 84 or 87, she would have to look it up. All food was being prepared on the front porch. Her great grandson has just finished grinding the coconut milk by hand (the grinder is on the table behind him) and was now mashing it the old school way with the boiled green plantains to make the hudut. This was not for show…this is how they do it almost every day. Here is the final product, my lunch. Mashed plantains in coconut with conch and pig tail stewed in coconut milk. Delicious. The fresh milk really makes a difference. In the end, Dangriga isn’t the prettiest place, it’s not particularly colorful, the beach isn’t great but I enjoyed walking around. Here are some of the typical houses you’ll see. But definitely walk around. Talk to the people that talk to you (well…not all of them). In a couple hours, I met an older gentleman and over a few sips of his Bitters, he lectured me why San Pedro isn’t “real Belize”. I met Dorian and my lunch cooking grandmother who was scolding her great grand kids in Garifuna and told me about how her two siblings who died in “the big hurricane”. And I met these two school kids who were watching TV at the local Chinese restaurant and were fascinated by getting their pictures taken. I boarded the 5.15pm $5bzd Hopkins bus tired, extremely sweaty, stuffed with garifuna food & beers. I am glad that I didn’t stay over night in Dangriga but uber-grateful for the four hours I spent there. And I know I’m going to get this question from a bunch of people. I am travelling alone and had no problems yesterday whatsoever. Today, I’m off to explore Hopkins. #HappyWednesday Rebecca!!! 🙂 Afet reading this post… I felt like I was actually traveling with you. Great post… #CANTWAIT to read what’s next!!! Le Roi, I am not in hiding. I absolutely give autographs upon request and seomtimes even when not requested. Cesar, you will always be my favorite diminutive friend. Excellent post. I am most interested in traveling south on one of my trips. Will likely rent a car instead of the bus! A great post! I loved the pics too! Thanks. I’m still in Hopkins and Dangriga seems like Manhattan compared to this tiny village. LOVED this post — totally made me miss Hopkins!!! I know it’s a bit of culture shock from SP – but glad you explored and embraced it! We’ll have to head down together some day — You must hike there as that’s the main appeal for me. We’ll save our pennies and hire a car for the lovely, lovely drive on the Hummingbird Hwy. I gotta figure out when to get over there and invade your loft! Find one of the guys in the yellow shirts. These guys are everywhere and the shirts say “Transport Management” or something like that on the back. They will tell you what to do.